The key bend mentalism magic trick will earn you a reputation for being an amazing magician. 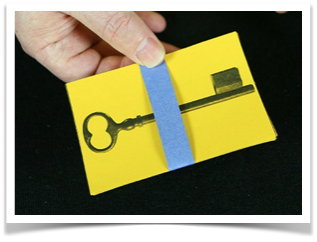 These instruction will show you how to make the pack of keys that you need to perform this easy but amazing mentalism magic trick. 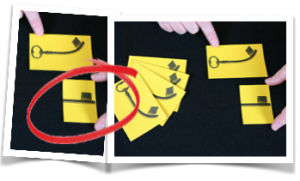 Print the keys out on a piece of coloured card (shown in the pictures left). You can download your artwork by clicking here. TIP: You can also print the keys on paper, but you will need to stick a second piece of blank paper on the back as the keys will shine through the paper it’s printed on when you turn it around. Cut all the keys neatly on the printed lines. Cut the ‘straight key’ along the dotted line. You will only use the bottom part as shown in the picture. Neatly stack all the cut out keys into a pack, making sure all the keys face the same way. 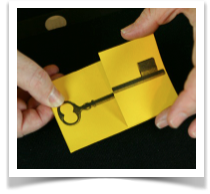 Place the ‘half’ card with the straight key stem on the top of the pile of keys. 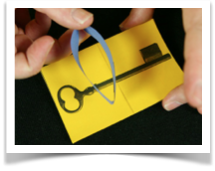 Make a paper band that fits neatly around your pack of keys. We have used a different colour as it adds extra misdirection. 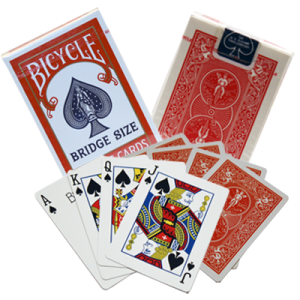 TIP: If you are using very thick card, a thick elastic band will also work. Now slide the paper band around the pack of keys. 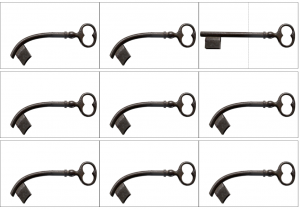 Use it to hide the edge of the cut straight key so that it appears that the whole pack of keys are full straight keys. 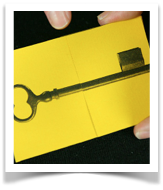 You are ready to perform the amazing key bend mentalism trick where you bend a key in an audience member’s hand. 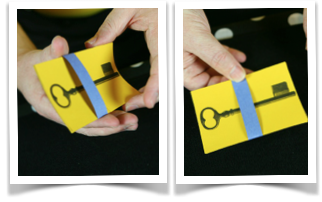 Follow this link to look at the video and see how to perform the key bend mentalism trick and entertain and amaze your audience.